Happy New Year. Wishing you a wonderful year full of many more ups than downs, health and happiness and plenty of time for crafting! I have to admit to feeling rather disappointed about my knitting output this year. I have so many, many things that I want to knit and looking at this year's rather paltry output makes me feel like I will never get to knit all the things like I really want to do. But then I have to remember two important things. Firstly, I am proud of what I have made and have really enjoyed making it. Secondly, and significantly, my neck and shoulder problems which I discussed in last year's round up are still having a large impact on my ability to knit as much as I want to. I have seen big improvements in the problems this year; I have been having regular physio and it is really helping. 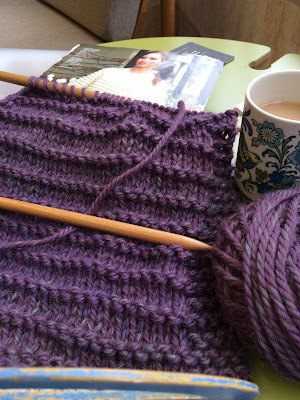 I have moved on from hardly being able to knit at all and being in constant discomfort to much more regular knitting and much less pain which is a definite win. So I need to be a bit more patient and a bit less unrealistic and a bit more satisfied with what I can do rather than thinking about what I can't. But that is hard. And all the things need knitting! 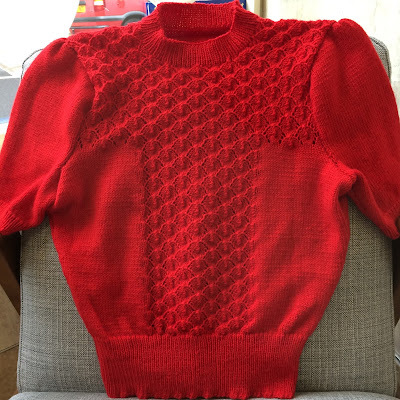 I have only made one garment for myself this year and it isn't a vintage knit which is unusual for me. 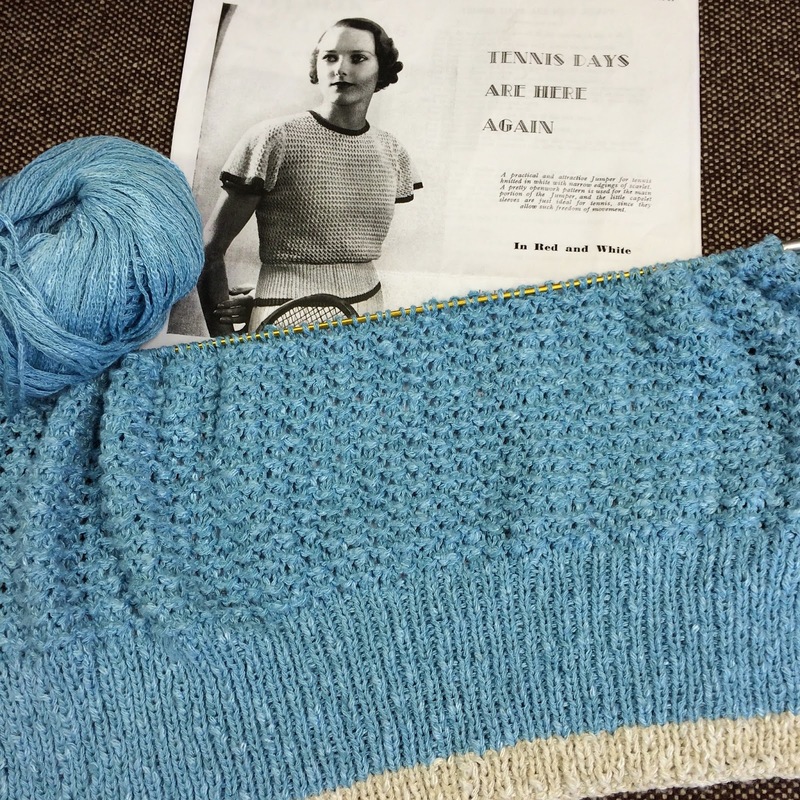 It is a boxy raglan cardigan, reminiscent of a 1950's jacket which is why is appealed. It is knitted in Debbie Bliss Roma Weave which is a super chunky yarn with lovely colours in it. I mostly knit 4 ply and double knitting so it was quite a change and I did feel like I was knitting on sticks. Whilst I wish that I had knitted a size smaller I am very pleased with it as it is lovely and warm. I don't have a photo of the whole thing yet though. This is a first size baby cardigan for my friend's little girl who was born in October. It is a dolman jacket from a 1950's pattern and is knitted in Debbie Bliss Baby Cashmerino. It has mother of pearl buttons. It was great fun to knit and I like the shape and the little lace panels. These bootees are for the same baby and are knitted from a vintage pattern which I think is an early 1950's one. They were a lovely little knit, interesting and reasonably quick. 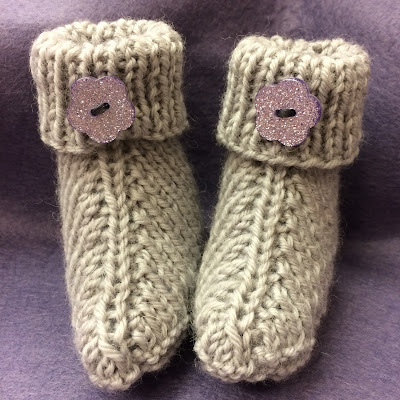 They are knitted in Cygnet Superwash DK. I did some pattern testing for Ribbon Circus. 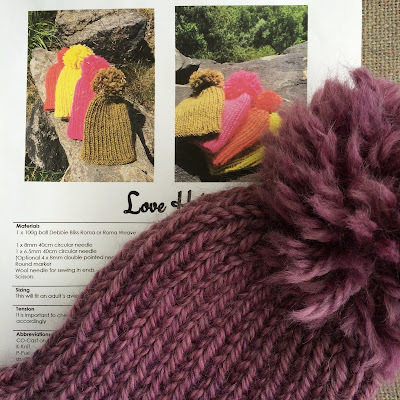 Helen designed two fabulous new hat patterns, both of which are lovely and snuggly. This is the Love Hat, knitted in Debbie Bliss Roma Weave and it would make a great first hat project. It also has a massive pompom which is always good. I don't have a photo of me in mine yet. This is the Stoodley Beanie and I loved choosing the colours and knitting the cables. Though I did mess some of mine up as I was knitting it when I was ill and I later found out that my brain had been too hazy to manage it! It is knitted in Sublime Extra Fine Merino Worsted which I just love, both for colours and softness. 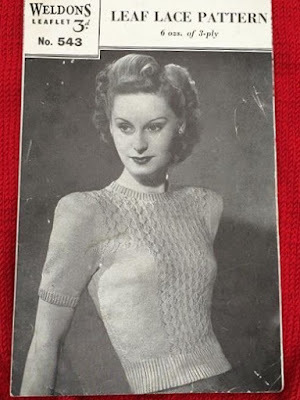 This 1940's jumper was a commission knit for the lovely Bianca who blogs at The Closet Historian. If, by some chance, you don't know Bianca's blog I suggest you go and visit straight away. She is a fabulously talented seamstress and makes some very gorgeous outfits. You can see her in this jumper here. The jumper is knitted in Debbie Bliss Rialto 4 ply which is very nice to work with. 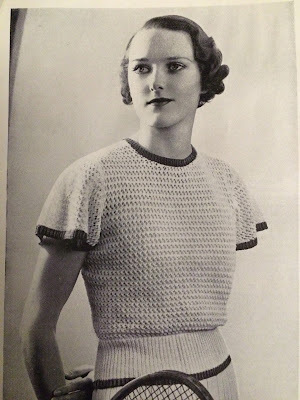 This 1930's tennis jumper was also a commission knit and was for the wonderful Cate who blogs at Vintage Gal. Again, if by some chance you don't know her blog you should head right over. Cate is another super talented seamstress who makes the most amazing, period accurate outfits. It was a joy working with these two fabulous vintage wearers. I knitted a lot of autumn leaves, way more than are seen here. I loved making them, they were so satisfying. I had hoped to make them into an autumn garland and also into a hat. I ran out of time for these as other, more urgent, projects needed attention. So I'm going to finish them off during this year so that come autumn I am all ready in my leafy splendour. I'm sneaking these two in as they are so nearly done that most of their knitting counts as 2016! They are both scarves. The top is for my niece, she requested, repeatedly, a pink scarf with yellow spots so I am doing my best to oblige. It is knitted in Sublime Extra Fine Merino Worsted. 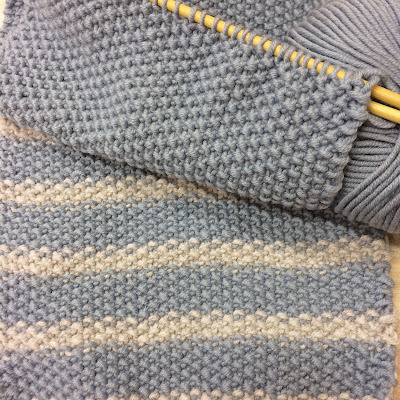 The bottom scarf is for my husband, actually it is part of his Christmas present but it isn't quite ready. I just had to wrap a ball of wool for him to open and apologise for the delay! It is knitted in the Sublime Worsted too. These are my completed (mostly) projects of 2016. I have knitted a few other things but they are languishing in various works in progress piles. They are mostly incomplete as they needed to be put aside for other things that had completion deadlines. However, my incomplete works pile is quite large, and a little shameful, so one aim for the start of this year is to finish some stuff before starting all the other stuff. I love a shiny new project though so this is going to be tough. I might put them together into a blog pot to spur me into action! Great overview! The red and pale blue sweaters are my favourites! Thanks Anthea. They are my favourites too. I didn't know that you took commissions! You're very talented, I guess I shouldn't be surprised. Beautiful work all around. Thank you for your lovely comments Jessica. I don't do lots of commissions but Im always happy to discuss if you see something that you want. Thank you Cate. I agree, you would freeze outside in that jumper at the moment! Awww. That is very kind of you. You've still managed more than me! And you've got some beautiful knits there. Don't forget to treat yourself to some more woollies this year. Thank you Mim. Lets hope that we both get some more knitted goodies this year! ohhh they are all so wonderful! I can't wait to see what other goodies you knit this year. Best of luck finishing those projects (you will!). I have now finished both scarves Liz. Hooray! Thank you. Thank you Gillian. It was so much fun playing with the colours for the Stoodley Beanie. I'm really happy with those I chose but have several variations that I would like to make. It looks like a lot of work to me! Knitting takes so much time, I would call this productive! I love your taste in colours, the cardigan for yourself is such a fabulous colour. I look forward to seeing what you make in 2017! Thank you so much Tanith. Here is to plenty of making for us both this year! Thank you so much for your lovely comment Bianca. You might not have knitted as much as you wished but look at the amazing outfits you made last year! I am so happy that you like your jumper and I would be very pleased to oblige if you ever wanted another one. Hello there, I'm Kate-Em. 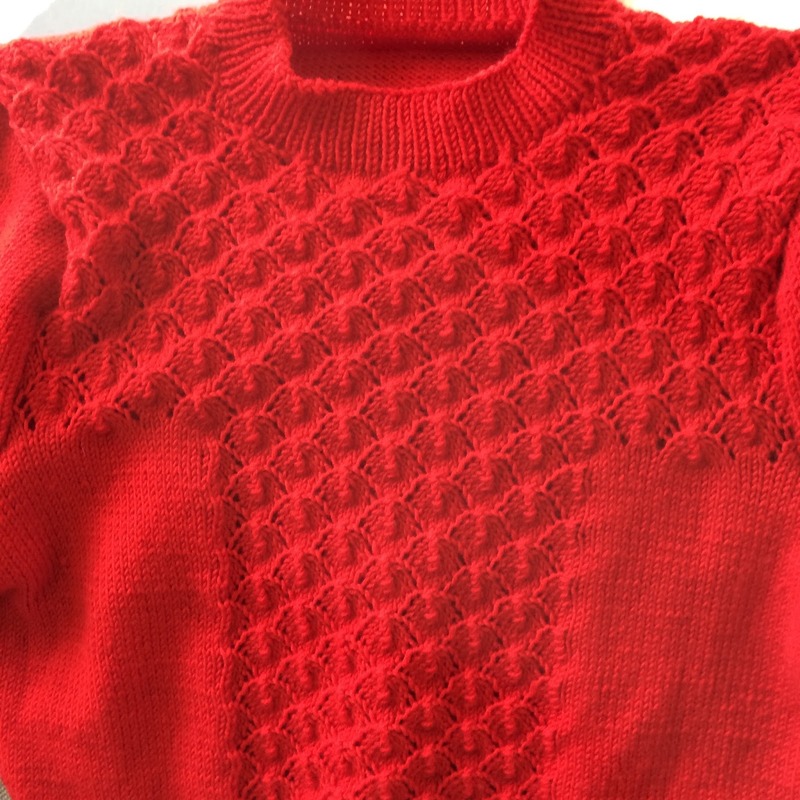 I am a knitter of vintage pieces, blogger, crafter, lover of old things and collector of stuff. 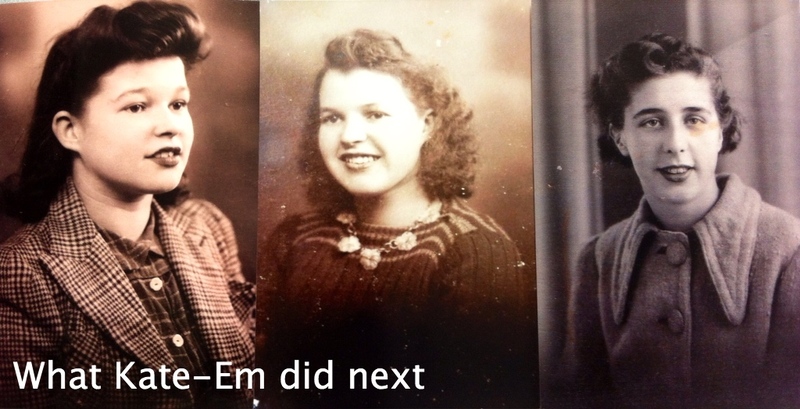 All the text and images on this blog are mine and are copyright of Kate-Em. Please do not copy. Simple theme. Powered by Blogger.